Top Canadian 2020 point guard Cashius McNeilly is on an official visit to Virginia Tech. He will sit in, and take in the action against number 4 Virginia in what is expected to be a sold out crowd at Cassell Coliseum. Cassius is fresh off an excellent performance at Basketball Without Borders in Charlotte, North Carolina. While many think that he will be committing to Virginia Tech since Uncle Jamie McNeillly is at VT as an assistant coach, Cashius expresses that he will be taking other official visits to Providence and Maryland and potentially others. Coach Jamie McNeilly has done his part in securing top players and getting them committed to VT. Nickeil Alexander-Walker is the top example. Based on the feedback from NBA scouts this weekend, Alexander-Walker is expected to be in the lottery of this year’s Draft. 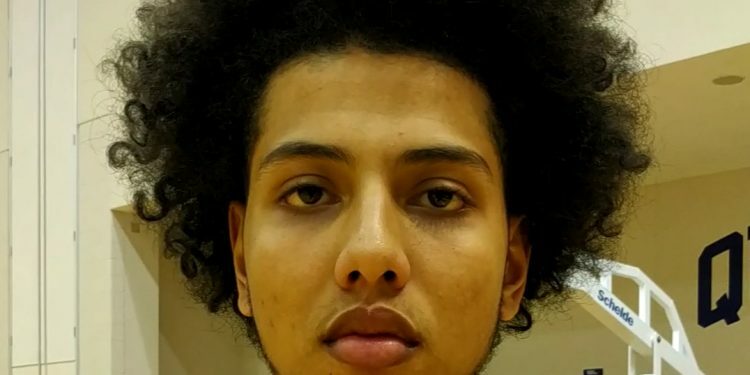 For Cashius, after returning to Canada to play at Thornlea Secondary under coach Charles Hantoumakos, McNeilly has had an excellent bounce back. When he returned from Huntington Prep he was overweight and since then has got himself back to national team shape where he once was. McNeilly is considered the top point guard in the class according to our Canadian National Player Rankings. The skill set displayed at Basketball Without Borders during NBA All-Star weekend was his perimeter shooting with flawless form, an increased explosiveness off the first step and a great touch for passing. His leadership among a group of kids with English language barriers was something handled really well. Cashius McNeilly has left NBA All-Star weekend in Charlotte and is now in Virginia for a 7:00 pm tip off.